Monitors and graphs the filesystem disk space usage. Local Disk: enables monitoring of the local hard disks. Network Mount: enables monitoring of mounted network filesystems on the monitored server. RAM Disk: enables monitoring of RAM disks configured on the server. Swap: enables monitoring of the system's swap file. Select the filesystem types, as required, from the drop-down list. To remove a filesystem type, click the x on the filesystem label. The Estimated Full Capacity section monitors and graphs the time remaining to full capacity based on existing load. 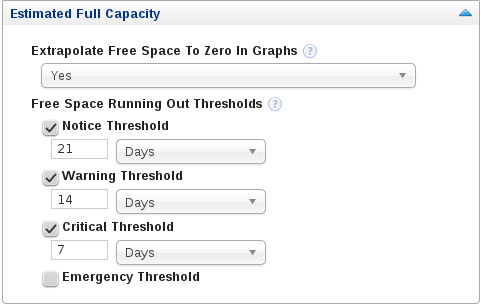 Extrapolate Free Space to Zero in Graphs: enables graphing of the projected time to full capacity, based on existing load. Free Space Running Out Thresholds: generate events based on when the free space is projected to run out. The Percentage of Space section generates events based on the percentage of free space available, relative to the total space on the monitored device. Monitors the percentage of disk space consumed per unit of time.